■ Operative intervention may be performed in any trimester if warranted by the patient's condition. ■ Pneumatic compression devices should be utilized. ■ Fetal heart tones should be monitored pre- and postoperatively. ■ Lead shielding and brief shots of fluoroscopy may be used judiciously. 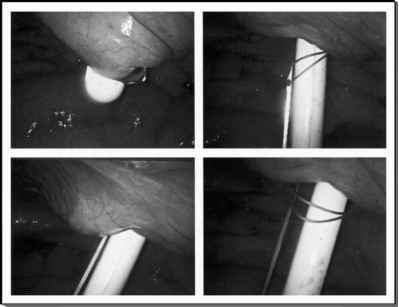 ■ Either the Hasson or Verres technique may be used for initial abdominal cannulation depending on surgeon preference and level of comfort with each technique. ■ Dependent positioning should be utilized to shift the uterus off of the inferior vena cava and the aorta. ■ Pneumoperitoneum pressure should be kept between 10 and 15 mmHg. ■ Obstetrics consultation should be obtained preoperatively. ■ Maternal end tidal CO2 should be maintained between 30 and 40 mmHg. ■ Tocolytics should be used for perceived or documented uterine contractions.